Need more information about booking Home 7131855 ? 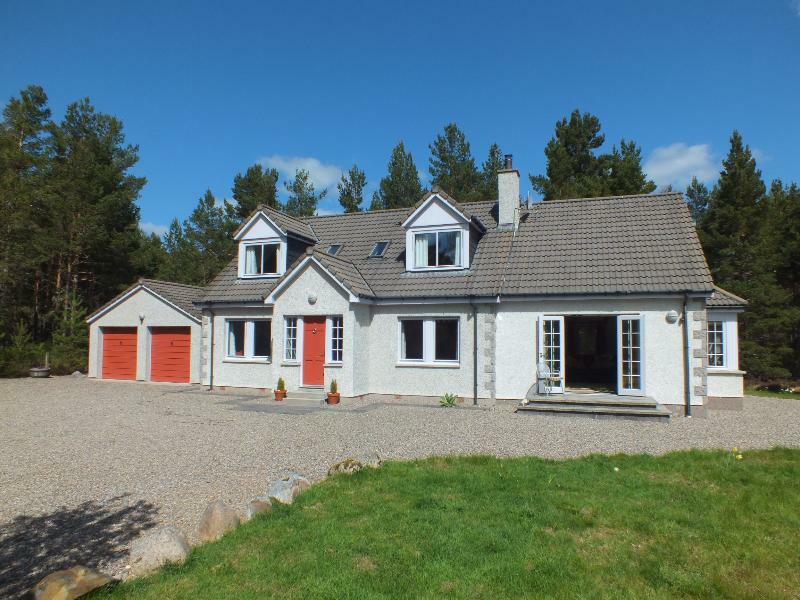 An Teallach is a superb holiday home surrounded in the peace and tranquillity of the beautiful village of Nethy Bridge and the Abernethy Caledonian pine forest. The village is at the heart of the Scottish Highlands in the Cairngorm National Park , well known for its beautiful scenery and local wildlife. Renovated to a very high standard, it is warm and welcoming with 5 bedrooms set out to sleep 10 people. It is very spacious inside with a high ceiling open plan area with lots of natural light and also benefits from a large private wild garden area, visited by lots of the local wildlife. The local area offers a wide variety of activities and attractions for all the family to enjoy. This House has 5 bedrooms, 4 bathrooms and sleeps 10. It’s been listed on Holiday Lettings since 18 Apr 2016. Located in Aviemore and the Cairngorms, it has 12 reviews with an overall rating of 5. The average weekly rate varies from £1031 to £2519. Located on the edge of Nethy Bridge, this is a fantastic 5 bedroomed house with loads of space and great facilities. The double height living / dining room is stunning and the wood burning stove was perfect for cosy nights. The snug room is also great for younger guests to claim their own TV room. Bedrooms are well spaced throughout the house and have ample wardrobe space. The kitchen is well equipped and there's also a separate utility room. Plenty of room outside for 5 cars. Enjoyed seeing the red squirrels visiting the nut feeders. Lovely area with plenty of activities nearby. Well recommended to stay at An Teallach. I with my family spent a week at this lovely house and I can easily highly recommend it. 'An Teallach' is spacious and comfortable and offers everything for the larger group. Set in a beautiful tranquil location yet only circa 10 miles from the more bustling Aviemore and circa 5 miles from Grantown-on-Spey, It is also very close to the RSPB Osprey observation venue (well worth a visit), and to many beautiful loch and woodland walks. We would not hesitate to revisit. Thank you Lorraine top marks also and for the personal touch by inviting questions and queries prior to arriving ensuring our holiday was exactly to our needs and totally hassle free. We spent a lovely week in An Teallach and were really impressed with the size of the home and all the facilities. The kids especially liked the "snug" where they could all chill out and watch TV away from the oldies on the comfy sofas. The rooms had plenty of storage space and comfy beds. It was lovely watching the red squirrels and deer roam around in the garden. The location is perfect for peace and quiet and is within a short 15 min drive of the Cairngorm Reindeer Centre -which we would definitely recommend visiting and is great for a base to explore the Cairngorms. The welcome pack of food and goodies was a lovely gesture and the owner was very helpful with responding to any queries promptly. There is a local Spar shop in Nethy bridge for supplies and we also did a big food order in advance with Tesco for home delivery when we arrived to stock up. We had some lovely walks around the nearby Lochs and also the local Castle Roy walk. Nairn beach was lovely to spend the day. We went to Inverness and did a boat cruise along the Moray Firth to try to spot some dolphins (although no dolpins around that day unfortunately) and visited Urquart castle/Loch Ness. This was a great place to spend a relaxing week away and we would love to come back again one day. You can get in touch with Elaine (the owner) through the contact form on this page. Send Elaine (the owner) an email through the contact form on this page. Alternatively, if there’s a phone number on this page, you can call them. How do I contact Elaine (the owner)? If you’ve already booked, go to Manage your holiday booking to view Elaine the owner's contact details or send them a message. Or send Elaine (the owner) an enquiry through the Contact the owner/manager form if you’d like a quote or more info first. When you pay online through the Book your stay form, a booking request is sent to Elaine (the owner). You’ll find out within 24 hours whether they’ve accepted - no money will leave your account before then. You can also request a quote from Elaine (the owner) through the contact form. The owner will email you the total cost for your dates and a link to book and pay online. Use the Book your stay form to pay provisionally online. You can pay by credit/debit card or PayPal. Elaine (the owner) will have 24 hours to accept the booking and no money will leave your account before then. Why can't I call Elaine (the owner) before booking? You’ll need to contact Elaine (the owner) to do this. Send them a message in Manage your holiday booking or through the contact form on this page. You can request to change the dates or number of people on your booking via the Manage your holiday booking page. To change your holiday dates use the Edit booking button. If you need to change the number of guests staying then send Elaine (the owner) a message. If Elaine (the owner) agrees, they’ll send you a revised quote outlining the changes. You can review and accept/decline this from the Manage your holiday booking page. You’ll have 48 hours to take action before the revised quote expires.